Movie lovers are awash in the insufferable winter sinkhole that follows Hollywood’s annual release of its best movies during the awards season. In the absence of quality on the current movie menu, let’s look instead at the outstanding performances by the five Oscar nominated actors. It’s not often that every nominated actor is this deserving. And if you’ve missed any of their movies, by all means brighten this gloomy movie time by seeing them all. STEVE CARELL (Foxcatcher) is thoroughly and consistently believable as an unhinged DuPont heir who thinks he can solve America’s ills by training and creating a wrestling team that will win an Olympic Gold Medal. Carell’s character unravels in direct proportion to his determination to control and bend people to his demented dream. This is a telling portrait of irrational behavior enabled by money. BRADLEY COOPER (American Sniper) plays Chris Kyle, a legendary Navy SEAL sniper. Though the political public has turned the film into a polarized national debate, Cooper has built a compelling picture of the interior damage suffered by a man who can’t morph between being a family man in an American suburb and a licensed killer in Iraq. BENEDICT CUMBERBATCH (The Imitation Game) captures the strange mixture of passion and social ineptitude that propels Alan Turing. Cumberbatch slides quite naturally between the arrogance and awkwardness at the core of this man who broke the German Enigma code during World War II. In a superb performance, Cumberbatch gives us a tortured genius. MICHAEL KEATON (Birdman) plays close to his own life story as he mounts a Broadway play in his determination to rebuild his image after being marked as failed, though once famous on-screen comic book character. In this real time unfolding of backstage/onstage drama, Keaton plays with the clashing egos of the characters that catch the drama of his own real life. 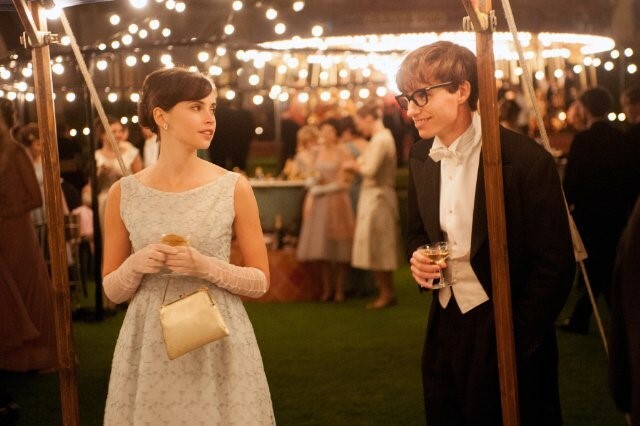 EDDIE REDMAYNE (The Theory of Everything) portrays legendary physicist Stephen Hawking while capturing Hawking’s loss of physical movement and speech to the motor neuron disease that crippled him in his 20s. Redmayne manages to convey Hawking’s undiminished brilliance and humor in an extraordinary performance. How he did this within the awful limitations of Hawking’s illness is the key to his mastery of the role. All five of these actors play characters based on real lives. Cumberbatch, Redmayne, and Bradley Cooper deal with biographical reality while Steve Carell and Michael Keaton become figures in fictional stories loosely based on real people. If these performances weren’t rooted in truth, we might see their movies as implausible, but because they are, they carry a sharp sting. Watching them is exhausting because their stories are real. That said, all five nominees were handed direction and scripts that brought out the best of their talents. They took it from there and injected intensity into five complex roles. What more can we ask? My pick: in a dream world, I’d give a shared Oscar to Eddie Redmayne and Benedict Cumberbatch. This review was posted on February 10, 2015, in Uncategorized. Bookmark the permalink.